As you walk through the store on your way to the dog food, you hear the peeping. You can’t resist taking a peek into the tubs of fluffy baby chicks. So adorable! You think, wouldn’t be fun to take a couple of them home? More and more people you know are getting chickens. Maybe you are lucky enough to get a carton of fresh eggs every once in a while from that lady at work who has chickens. They really do taste better than store-bought eggs! You think, wouldn’t it be great to collect eggs from my own backyard? Yes, keeping chickens can be rewarding in so many ways. Chickens make great pets that are good for lots of entertainment AND provide you with a delicious source of protein. Why not go ahead and throw a few into the shopping cart along with the potting soil and light bulbs? Chickens are not an impulse purchase. Don’t get me wrong. I think everyone should consider getting chickens. But the key word is consider. Before jumping in, you need to think about whether you are ready for the responsibilities of chickens, and whether you have the time and resources to properly keep and care for them. 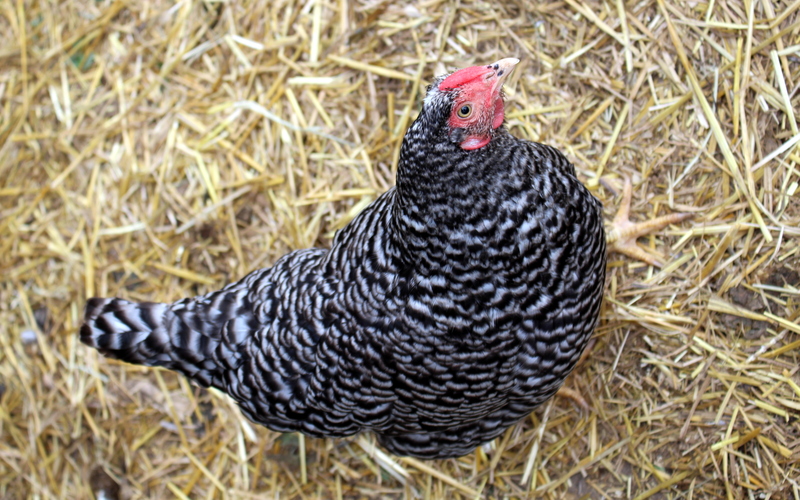 There are a lot of things to think about before getting chickens, but those considerations can be boiled down to three main questions, which I am sharing below. And, to give you even more to think about, I’ve asked Counting My Chickens readers to share some of the things they wish they knew before getting chickens. Scroll down to the end to read their responses. 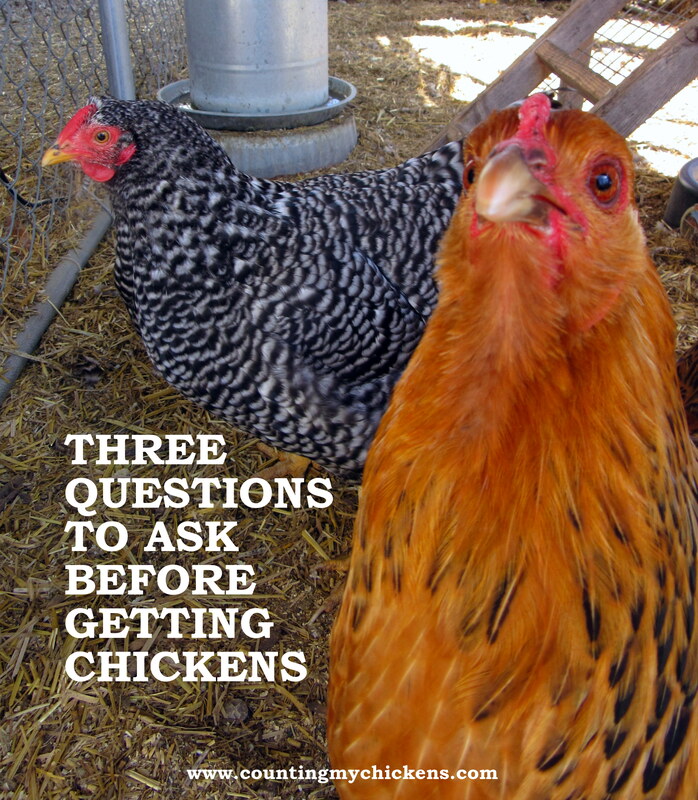 Don’t even think about getting chickens until you ask yourself the following three questions. 1. Are chickens legal where I live? Unless you have the good fortune to live on a farm in the countryside, the chances are you are subject to rules that restrict your ability to keep chickens. Lurking in property deeds, zoning ordinances, homeowners association rules, and rental agreements may be rules impacting how many chicken you can have (which might be zero), where you can keep them, and all aspects of how you keep them – from where you store their food to how you dispose of their poop. If you jump into into chicken keeping without first checking your local laws and ordinances, you may someday be surprised to receive a cease and desist letter that tells you to get rid of your now-beloved pets or face legal action. Stay on the right side of the law by knowing the rules that apply before you bring your flock home. And if you find out chickens aren’t allowed where you live, don’t despair. Consider banding together with like-minded chicken lovers in your community to get the laws changed. 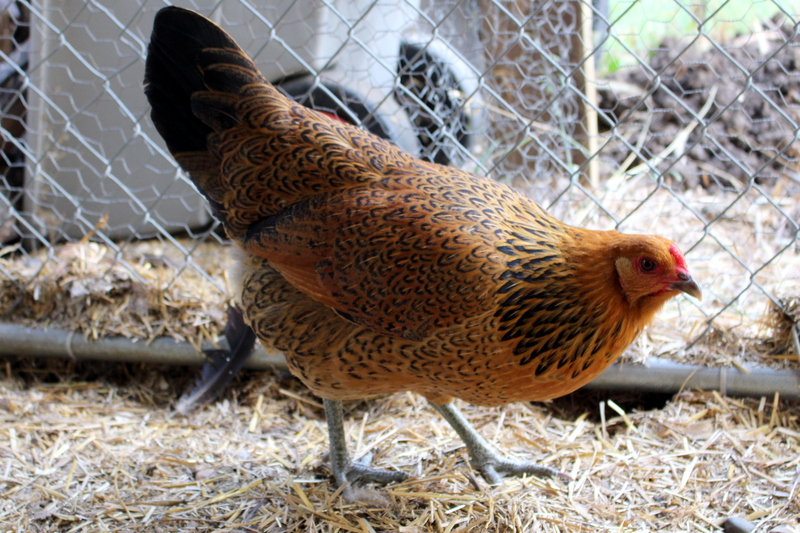 Read more: Is it legal to raise chickens in my suburban backyard? 2. Do I have a place to keep chickens? So, you did it. You’re bringing home a cardboard carrier with little windows cut in it to make it look like a cute little house. And it’s full of baby chickies just a-peep-peep-peepin’ away. That nice man at the feed store helped you pick out a heat lamp and bedding material, and he even threw in a big cardboard for you to use as a brooder. You have a waterer, a feeder, and specially formulated starter feed. You’re all set, right? Those babies won’t stay babies for long. 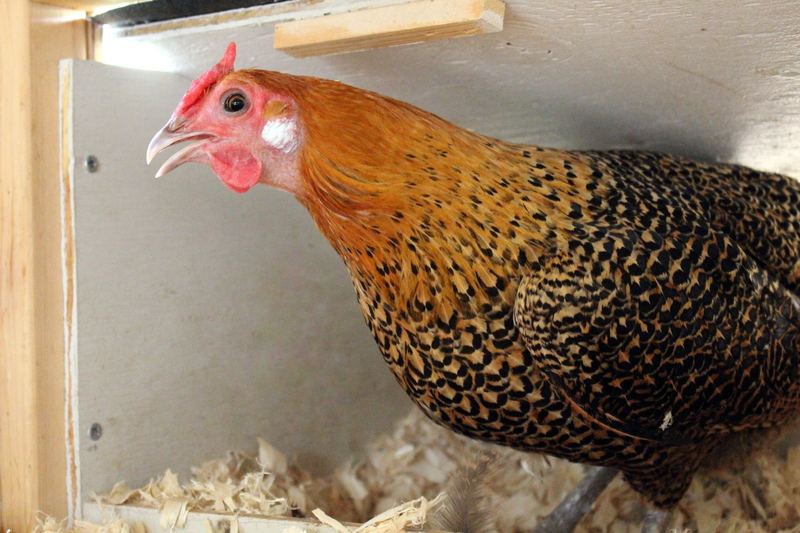 It won’t be too long before they outgrow their brooder box, and what do you do with them then? What is your plan for housing your new flock? When it comes to living space, chickens have some basic needs: An indoor space to roost at night, an outdoor space to get fresh air and exercise, and a quiet place to lay their eggs. Chicken housing needs to be secure from predators and provide protection from the elements. It also needs to be accessible so you are able to provide the care and maintenance your chickens will need. Do you have the resources to buy or build a place for your chickens to live? Chicken coops can be expensive, especially if you aren’t handy enough to construct your own using repurposed materials. And don’t forget about those pesky laws, which may require you to obtain a building permit or meet certain building code requirements for your chicken coop. 3. Do I have the ability to properly care for chickens? Just like your pet dog or cat – or your children for that matter – your chickens are living, breathing creatures that will require a certain amount of care in order to survive and thrive. Do you know what it takes to care for them? Do you have the time and resources to provide proper care? First, there are the obvious things like providing food and water on a daily basis. Then there are things like letting the chickens out of their coop each morning (warning: chickens want to get up with the pre-dawn light), collecting their eggs, and locking them safely in the coop each night. Beyond your chickens’ daily needs, coops and pens require regular cleaning and maintenance. Chickens sometimes get sick or injured and need medical treatment or first aid. And all chickens eventually die, sometimes suddenly without warning. Are you prepared to handle these things as they occur? Before getting chickens, it’s important to consider whether you have the ability (and time) to provide proper care for your birds. Also think about what will happen when you’re not there. If you ever go on vacation or travel for work, you will need to make arrangements for someone who can care for the chickens in your absence. Read more: Carrying for your suburban chickens: How much time does it really take? Lori L.: Before I had chickens I read that they poop a lot. I just never understood how much “a lot” is. It means a truck load! And that they will ruin every last spot of grass you own. I never thought I’d have a dirt backyard but I do now. Joe F.: You have to fence off your garden as they will eat almost any flower and vegetable they can reach … but you’ll turn your nose up if you have to eat a shop bought egg! Sondra S.: That they can fly. Jessica A.: I wish I knew how much work they were, especially in the winter. But they are so worth it and each one has their own personality! They are so much fun to have! Anna R.: You need so many feet per bird and then some. Jazzy J.: They will lay their eggs anywhere not in the boxes you brought for them. They love grass so they need a lot of space to roam. You will love them like pets! Can’t stop at 1. Debbie M: Have chick/chicken first aid supplies on hand. Get a book about common chicken ailments and how to treat them. Eventually you’ll become an amateur chicken vet. Shay L.: When choosing look at their feet to make sure they have ever no major deformities, One of mine had a severe foot issue, after we got her home we taped it to help correct as much as possible, she has no trouble perching but If we had not attended to it she may have had problems. Nicola F.: Bumblefoot! And how easy it is to catch, we tried to protect ours from foxes with a chicken wire skirt around the edge of the coop, little did we know about the hazards of bumblefoot then. Tanya H.: Gnats can kill them! We lost about 7 young birds one spring when a wave of buffalo gnats moved through. I have never been more heart broken. Jenness A.: How heartbreaking it is to have one die. I don’t know how you prepare for that, though. It happens and it’s just as devastating as your dog or cat dying, sometimes more. Melissa D.: You will get very attached! They have become our pets. And, they are super messy; always need to watch where we step and we only have three! Star F.: I wish I had known that I would have enjoyed them so much so I could’ve built a bigger coop to begin with. Amber S.: Chicken math is real, build coops and runs bigger than you think you need – or you will be expanding and building next year too. The importance of setting up an isolation area before you need it. Andrew D.: You can’t JUST have two. Katie O.: Not all of the advice out there pertains to you. It may seem like fact, but it’s just advice. You need to take into account where you live, what the predators in your area are, the size of your operation, your budget, preferences … take what you need, leave the rest. Do you have chickens? Is there anything you wish you had known or considered before you brought your birds home? Please share in the comments section below. This entry was posted in Raising Chickens and tagged backyard chickens, chicken care, getting chickens, suburban chickens by Deborah Neyens. Bookmark the permalink.